 The Domaine Charles Baur is an organically-run estate of 18 hectares. Vineyards are located in Eguisheim and in other towns. Predominantly composed of argilo-calcareous soils, the slopes of varying degrees of steepness around Eguisheim offer excellent wine growing conditions. They are protected by the Vosges mountains where rainfall is light (less than 550mm on average per year). These weather conditions allow the grapes to mature naturally, minimising the risk of disease. The Grand Cru Eichberg terroir has a top soil of clay and an undersoil composed of limestone and sandstone. Celebrated since the Middle Ages, the wines are full, round and concentrated. The Domaine Charles Baur has 2.5 hectares of vines in this “grand cru” where Riesling, Pinot Gris, Muscat and Gewürztraminer are grown. The Grand Cru Pfersigberg is situated on steep slopes of limestone marl which allow for excellent drainage. It is south-facing and benefits from maximum sunlight. Its wines are of the greatest finesse and are marked by the limestone, revealing a bouquet which is both floral and fruity. The Domaine Charles Baur has one hectare of Gewürztraminer vines in this appellation. The Holzweg is a north-facing incline whose concentrated wines reveal great aromatic complexity. On this terroir, we cultivate 0.3 hectares of Gewürztraminer. The Fronenberg is a slope comprised of a clay top soil on a base of limestone. Orientated in a north-easterly direction, the microclimate is predominantly windy and dry and the wines produced display elements of the limestone beneath. They are full-bodied in flavour and leave a fine aftertaste. Here, we grow 0.7 hectares of Gewürztraminer grapes. The Domaine Charles Baur also exploits several parcels of land situated in the Grand Cru Brand appellation in Turckheim, five kilometres to the north of Eguisheim. This is a very steep slope of fine granite and sand with a south/south easterly elevation and produces wines of a remarkable finesse. The grapes which we grow here are from the most part Riesling (0.5 hectares) supplemented with some Pinot Gris. Harth is composed of alluvial soils which produces lighter wines that are delightfully fruity and floral on the palate.